This brief presents the concept of Creative Foresight Space (CFS), which is an alternative workspace as well as a foresight methods-based processing platform for a new kind of proactive and innovative working culture. CFS is a concept to stimulate both creativity and futures thinking. It combines physical, digital, virtual and peer-to-peer collaborative approaches for innovative and social futuring in organisations. It is designed especially to meet the challenges posed by the transition from information society to a meanings society. CFSs also provide a diverse platform for special futures workshops – called Futures Cliniques. CFSs enhance work milieus, augment work motivation as well as strengthen futures thinking and foresight competence. Innovations are born where there is enough encouraging space for creativity. Companies and organisations striving for innovation are increasingly interested in creating workplaces and workspaces that promote interaction, creativity and innovation. Companies and organisations have an immense unused potential to develop creative and innovative work environments. Such development can be linked to the attraction of regions or towns. As the operational environment of companies and organisations has changed, foresight has gained more ground in their operations. Companies should link foresight both to their strategy work and innovation processes. In order to bring systematic foresight and innovation processes into a company, the whole organisation needs to be committed to a new way of thinking. This, in turn, requires a new culture of managing as a part of a whole new working culture. Such new culture of managing may flourish if new kind of work milieus are enabled. Creative Foresight Space (CFS) will provide a new type of work milieu as integrated into ordinary offices. CFS links innovation processes (creative thinking) to foresight processes (futures thinking). The project on Creative Foresight Space was initiated to find out the possibilities of developing better work environments. This was sought for by supporting the processes of organisational change through a Creative Foresight Space that encourages creativity and futures thinking. In addition to developing the concept of creative foresight space, the project included a wider foresight process that concentrated on the knowledge and expertise needed in the future. The theoretical objective of the study was to develop a concept of an innovative and experimental working space to stimulate at the same time creativity, futures thinking and wellbeing at work. The concrete aims of the study were to design visually stimulating Creative Foresight Space (CFS) 1) to host participatory foresight sessions, especially Futures Cliniques, 2) to provide a space for self-organised futures exploration, 3) to demonstrate and apply several methods developed in futures research for futures sense-making and innovative problem solving for companies, public institutions, regions and citizens. CFS and Futures Cliniques were designed as a structured process, employing user-friendly multisensory instruments for open futures learning. Part of the study was to probe possible futures for societal development and for the future of work. This was conducted through literature surveys, interviews (https://sites.google.com/site/futuremediac/videos–presentations) and participatory foresight sessions held in two regional CFS pilots. The ultimate purpose of CFS was to help decision-makers by opening up vistas and even unexpected prospects for future developments at a longer and broader perspective than standard strategy. Creative Foresight Space (CFS) is a methodological umbrella concept, developed at Finland Futures Research Centre (FFRC) within the project. It manifests itself as a futures gallery or social futures learning hub, to enhance working milieus in all kind of organisations. It also acts as a platform for participatory, co-creative foresight sessions. Such sessions were structured as special Futures Cliniques. In Futures Cliniques several foresight methods are used to probe futures for the subjects selected. The methods demonstrated and applied in all Futures Cliniques included for example the Futures Wheel, which is an easily applicable and discussion-oriented tool, and the Futures Table. In particular, the Futures Window was used, which is a visual presentation of weak signals, stimulating the futures work to follow watching it (Heinonen & Hiltunen 2012). On average, at least five different foresight methods are always being demonstrated and used within a Futures Clinique. The Futures Research Methodology CD Version 3.0 (Glenn & Gordon 2009) produced by the Millennium Project (http://www.millennium-project.org/) was also frequently employed. In addition, material from the iKnow project (Ravetz et al. 2011; http://community.iknowfutures.eu/) was used and further elaborated. Besides foresight methods, also several innovation techniques were being applied in Futures Cliniques, e.g. the method of de Bono’s (1985) Six Thinking Hats. The participants were not required to be familiar with any of the methods beforehand. Instead the idea was to enable futures learning – both content-wise and methods-wise. The visual design and mood of the Creative Foresight Space is a method in itself, aiming at multi-sensory futures exploration. In some of the sessions, emphasis was laid on visualisation and visual material from cartoons to pieces of art were experimentally used to nourish the participants’ imagination (Heinonen & Kurki 2011). Two concrete cases of CFS were installed for a certain period of time (ca. six months) for experimenting. During the experiments, all the results were carefully identified and documented. One of the cases was CFS set up in Helsinki City Library in 2010 (in Finland). The other case was implemented inside a technology Centre Innopark in Hämeenlinna region (in Finland). The concept of CFS can be implemented in two separate modes: the Stimulus version or the Slow version. 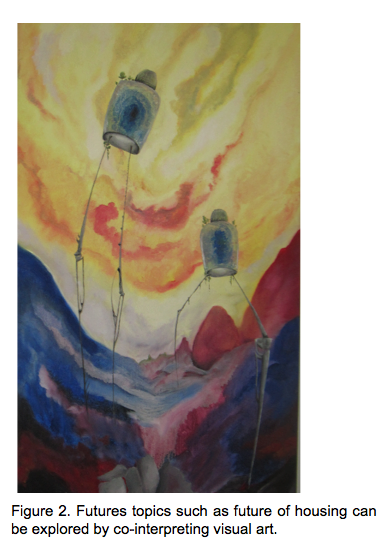 The Stimulus version aims to excite and explode imagination and through such stimulation enhance creativity. The Slow version, on the other hand, enhances creativity through elements soothing the visitor and letting time and space for new ideas or understanding to emerge. This kind of futures learning (Heinonen, Kurki & Ruotsalainen 2012) can be achieved through slow motion digital walls, or by providing niches for silence and solitary futures exploration. The most important socio-economic trend identified during the project was the shift from the information society towards the meanings society. Applying this shift to work, the central findings were the need for new organization models, radical mixing of different industries and branches, as well as utilizing prosumerism (producers + consumers) in a new work paradigm. Adding to these a set of new competences and skills were identified. The diamond of seven competences that are critical for future work life in 2020 was presented. The future of work and the future economy will be shaped especially by changes in two intermingling areas: the technologies used and people’s ways of life. The guiding technology for the future will, quite unsurprisingly, be the Internet with its different applications and services. The Net will affect our culture deeply. The values and norms of web 2.0 will spread to the entire society – and the workplace. Digital natives will take participation, bottom-up approaches, collaboration and sharing for granted. They are intrinsically motivated rather than extrinsically influenced. Adding to this, people strive more and more for a life that is personally and individually meaningful. The source of meaningful experiences can be anything, be it consumption, work, arts, or social relationships. The Internet and other key technologies and services (e.g. cloud computing, mobile devices, application services) together with the strengthening ethos of self-expression are leading away from the information society to a new societal form, the meanings society. This transition will have a significant impact on how we work and on the organizations in which we work. Despite automation work will not disappear. People are simply doing what gadgets are not capable of – taking care of creative, non-routine and un-linear tasks. Nevertheless, by 2050, work can transform in such a deep way that one can declare the end of work as we know it. We might see a return to the roots of work, to the time before the institution of paid work. Work per se is an act of creativity, which aims at satisfying our material and immaterial needs. People enjoy working, because it manifests their best qualities: creating, solving problems, using ones skills and crafts, developing one self. Working creates the experience of autonomy as well as binds people to each other through the division of labour. Work is an act of individualism as it is that of collectivism. Instead of the institution of paid work under an employee, in the future self-organizing peer-to-peer production and prosumerism could form the basic framework for work institution. In the future, the ideal worker may not be a diligent toiler with narrow expertise, but an enthusiastic and ingenious amateur (Heinonen & Ruotsalainen 2012). Workers know well their field of expertise, but are curious and interested in a myriad of things. Engineers cherish the ideal of the Renaissance Man. Of the general work competences especially time competence, systems competence and meanings competence are needed. Especially meanings competence can be of most crucial importance in the future. Production in the creative economy is in essence cultural meanings. Communication is carried out through meanings. Production aims more and more at products and services which aid in identity production and constructing a personally meaningful way of life. This is not solely a concern of the creative class, but all industries have to take into account this change in society and consumer demand. Meanings competence is the ability to create and interpret meanings, construct and communicate social reality. Workers need meanings competence not only as tool, but also as a skill to construct one’s work as comprehensible, fulfilling and meaningful. Jobs will be less and less clearly defined, and workers must learn to “define” their jobs for themselves. Creating meanings competence is a social process, which calls for interaction competence: culture is by definition social, shared. Creativity, stories and innovations can only be created in socially livable environments, in which the interaction between individuals is fluid. Socially lively work means also taking consumers along in the production process: it is the best way to ensure that the products and services will be deeply meaningful. Essentially, meanings competence is not only a matter of work life, but people will increasingly strive at creating their life meaningful and purposeful. The most important trend identified considering working life was not only the mixing together of different industries but different spheres, values and procedures: consumers becoming producers (and producers consumer-like), work becoming leisure-like (and vice versa). This development has several benefits, as it helps making work more meaningful and products more demand-matching. However, it contains serious threats: instead of work becoming more meaningful and fulfilling, it can attain too big a role in our lives. Furthermore, these issues are linked with the emerging theme of the changes between public and private spheres. Perhaps not by 2020, but most probably by 2050 technology has melted to become an inseparable part of our environment, but also of ourselves. Our thinking, communication, work and leisure are intermediated, supported and enhanced by technology. One of the most prominent effects of technologies is the dramatic fertilization of communication. Vivid communication promotes openness, which on its part promotes innovation. We are increasingly living a life of ubiquitousness and transparency. It is a matter of further investigation what are the pros and cons of this development. Clients for recent Futures Cliniques conducted by Finland Futures Research Centre include for example the Finnish Ministry of the Environment, the Finnish Innovation Fund, Technology Centre Innopark and Helsinki City Library. For each Futures Clinique the participants were selected to represent different industries, branches and fields. The heterogeneity of the participants and co-creative methods used resulted in various progressive and future oriented ideas. For example, the Futures Cliniques considering the futures of libraries helped in redesigning of the activities of Helsinki city library “Kohtaamispaikka” (Meeting Point). The participating case organisations profited from the project in the form of new ideas for future development. In addition to the core concept (CFS), it was possible to test some of the tentative ideas, as well as the new techniques, products, services and processes of the participating organisations in the workshops. The participants also received all the material created in the project and in the Futures Cliniques conducted within the CFS. The results of the project were also presented in the media, which both disseminated information and made the project more influential on local and even regional level, thus giving the participating organisations a means for marketing. The project also added to the wellbeing of the participating organisations’ employees. Visiting the Creative Foresight Space and attending Futures Cliniques were often regarded as legitimate out-of-official-role behaviour and relaxation with futures-oriented intellectual stimulation. Concrete input for regular work was provided by the ideas and innovation germs picked up from CFS, together with adoption of a more holistic and longer-term looking ahead. The project implicated the untapped possibilities of collaborative, co-creative and peer-to-peer foresight activities. Participatory foresight or planning methods could be used considerably more in policy and decision making processes. In government, each Ministry could have its own Creative Foresight Space. 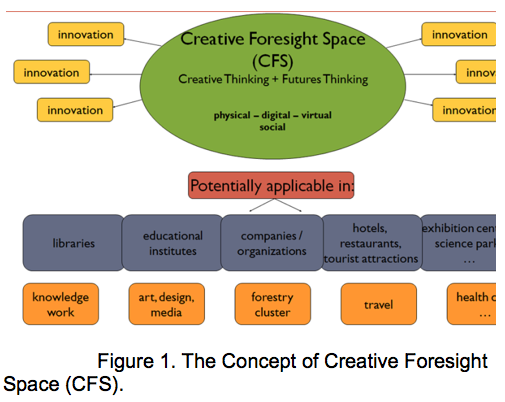 Large companies and organisations could have their own Creative Foresight Space, while smaller enterprises could share a common CFS, located e.g. inside a technology park, science hub or conference centre. Another central issue is the planning and designing of public spaces. The concept of CFS could be implemented not only in corporations, but in public spaces and public enterprises too. This would not only improve work-related wellbeing but benefit democracy and participation. For citizens, libraries and educational institutes would be ideal places for futures learning through Creative Foresight Spaces. Ubiquitous digital technologies and Internet-platformed solutions have a huge potential to provide for creative processes as well as participatory policy planning and democratic decision making. The potential of Internet-based technologies and services should be further examined especially in conducting virtual foresight workshops, cross-fertilised with face-to-face Futures Cliniques. The project on Creative Foresight Space with the introduction of this hybrid concept for futures learning, and with its documentation of the results from two experimental cases is the first step. The second step is to disseminate the experiences of these cases to make a concrete call for further action. The concept of Creative Foresight Space and of Futures Cliniques could be revisited for involving policy-makers more directly in the foresight processes. These tools can be utilised to enable decision-makers, experts/researchers, planners, and citizens to collaborate − crowdsourcing the futures, “learning” the futures. Download EFP Brief No. 237_Creative Foresight Space for Enhanced Work Milieux. de Bono, Edward (1985). Six Thinking Hats. Glenn, Jerome & Gordon, Theodore (ed.) (2009). Futures Research Methodology version 3.0. CD. Millennium Project. Washington D.C.
visual weak signals to enhance anticipation and innovation. Futures vol 44, 248-256. Heinonen, Sirkka & Kurki, Sofi (2011). Transmedial Futuring in Creative Foresight Space. In publication: Wagner, Cynthia G. (ed.) (2011). Moving from Vision to Action. Essays published in conjunction with the World Future Society’s annual meeting. pp. 119-128. World Future Society, Maryland. Heinonen, Sirkka, Kurki, Sofi & Ruotsalainen, Juho (2012). Futures Learning for Future Work. From Know How to Know Why. Manuscript. Forthcoming. Heinonen, Sirkka & Ruotsalainen, Juho (2012). Towards the age of neo-entrepreneurs. World Future Review, Journal of Strategic Foresight.